While I don't think a bored child is necessarily a bad thing (it usually sparks the play times that I find most amusing to watch), there are times where boredom makes for a super-cranky kid. In our house, a super-cranky kid makes for an even crankier mama. When C has a night out, M misses him. That missing makes time go even slower and boredom comes to the party earlier than usual. Those are the evenings I try to think of something creative and fun to do in the kitchen. I know I've mentioned a few times in the past that M and I do a bit of cooking together, and it's never some elaborate recipe. 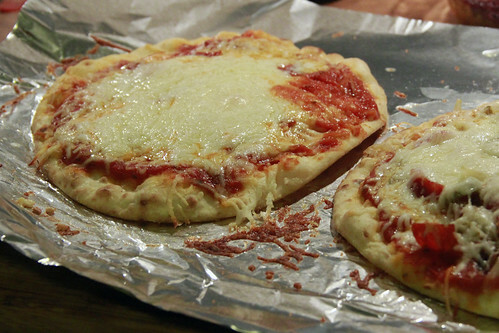 This most recent time was a flashback to my own childhood: pita pizzas! It doesn't take but about 10 minutes to actually make them, but M liked "painting" the sauce on, trying different toppings, and piling on the mozzarella. All in all, M and I hung out in the kitchen and cheesed it up for maybe 20 minutes, but for the next 2 days she told everyone about how she made her own dinner. 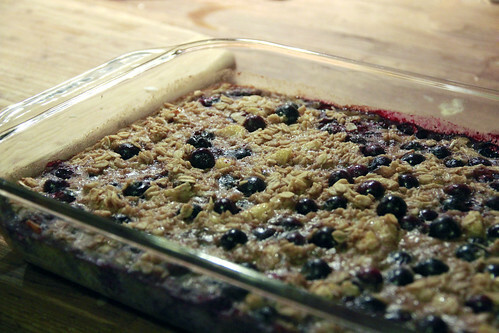 Another fun recipe we do together is Baked Oatmeal (from Super Natural Every Day by 101 Cookbooks' blogger Heidi Swanson as featured on Lottie and Doof). M cuts the bananas (easy enough to do with a dull dinner knife) and stir and stir to her heart's content. The result is a moist, somewhat cakey, slightly sweet oatmeal concoction that I think is just as good straight out of the fridge as it is still warm from the oven. I'd call them both major successes: bonding time, relatively easy to make, not terrible for us, and total boredom busters. What else could you ask for in a recipe? How fun! I'm excited for when Will is ready to participate in cooking. I've tried having him help bake, but he just tried to eat the flour. But he was having so much fun pouring water this weekend that hopefully we'll get there soon.